ineractive wand: You have to get one of these! Go to Ollivanders (another must-do) and buy one! They range from about $40-$60, but it’s worth it. You can interact and actually cast spells in the windows! It’s amazing to see your spells actually work – opening books, splashing water and more cool stuff. The Escape From Gringotts Ride In Diagon Alley: This ride is soooo fun but there’s always at least an hour line. You’d be lucky if it was 30 mins but it is AMAZING! Here’s a hint: you can go in the single rider line because a lot of the time it’s shorter. You might even have someone nice in front of you and your whole family could end up going together! Butterbeer Ice-cream at Florean & Fortescue’s in Diagon Alley: If you want some good ice-cream, go to Florean & Forescue’s and get Butterbeer Ice-cream!!!! It’s basically butterscotch ice-cream with caramel swirls. But be prepared- there might be a line out the door! Ollivander’s: Go to Ollivander’s if you want to get a wand! You get to expeirience the full wand choosing and maybe even have a wand pick you! Afterwards, you go into the wand shop and can buy a ineractive or regular wand whether you got chosen or not. 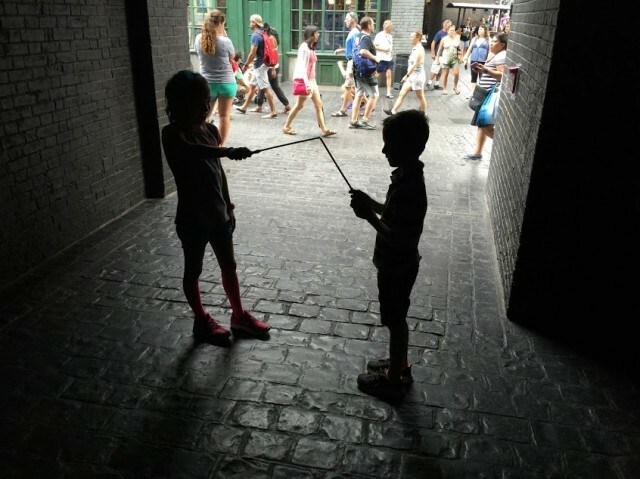 Interactive wands are usually $40-$60 and regular range from about $35-$45. You can either buy a wand of most characters from the movies and books, or you own wand, which none of the characters in the movies or books has, just you. If you want, you can ask a wand seller what the wand you want to buy is made of if you’re looking for a certain one. Wands could be made of vine, oak, etc. and can have a core of unicorn hair, dragon heartstring, and much more. Usually the line isn’t too long, but its never gonna be less than about 15 mins unless you have perfect timing because it’s kind of like a show. Flight of the Hippogriff: this is a super easy, super fun small roller coaster. While you’re on it, you get to be up close to a hippogriff, and get a great view of Hagrid’s Hut and Hogwarts from the top of the small hill. There is an express pass for this and usually the line isn’t too long. HoneyDukes: I love this candy shop with so many great candy from the movies and books! My favorite is the chocolate frog!